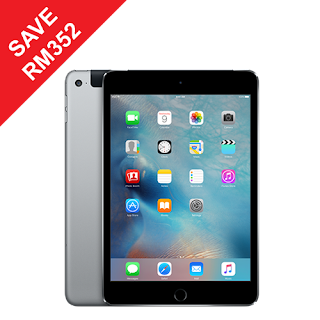 Clearance Price: RM1,449 (Save RM352 from RM1,801) Official Apple online store has stopped selling iPad Mini 3 for quite a while so this will be your last chance to buy an iPad Mini 3 from authorised Apple reseller in Malaysia: Machines at discounted clearance price. The most advanced iPad mini has the Touch ID fingerprint identity sensor, a 7.9-inch Retina display, a powerful A7 chip with 64-bit architecture, an iSight camera, a FaceTime HD camera, fast wireless, iOS 8, iCloud and up to 10 hours of battery life.1 It also comes with great apps for productivity and creativity. And there are many more apps available in the App Store.